My mother is the most beautiful woman in the world. Everyone is in agreement on that, too. Her name is Helen - Helen of Sparta at one time, but later Helen of Troy, after she went away with the Trojan prince and left me behind with my father. There was some disagreement about weather she went willingly or if the prince abducted her. Knowing my mother, I would not be surprised if it was her idea. "Oh, no," I protested. "It wasn't my mother's choice. Paris abducted her. I'm sure of it." Clytemnestra lookaed at me with a small smile and shook her head. "It pains me to tell you this, Hermione, but you're wrong. I know my sister. Helen was not abducted. She went willingly." Her reply upset me deeply, and I burst into tears. If my mother had gone willingly, then she had truly abandoned me as well as my father. I could not forgive her. I sat close beside him. "What brings you here, Orestes?" I asked, puzzled. "What can I do for you?" He raised his head and gazed at me searchingly. "Love me," he said. "Just love me, Hermione." "Love you? But I do love you! You must know that, Orestes! I've loved you for a very long time - it's just that we've never spoken of it." "I want to speak of it now, Hermione. I don't want to die without speaking of it." I wondered at first how Menestheus cold have married such a plan-looking woman - square jawed, her small eyes set too close together - when he'd once been in love with Helen of Sparta. But perhaps he'd been wise enough to recognize early that a warm heart is worth far more than all the world's beauty, and I admired him all the more for it. I am a sucker for a good historical fiction novel. I'm even a bigger sucker for Carolyn Meyer. Carolyn writes her characters true to life - or at least I imagine to to life considering her characters typically have been dead for a couple hundred, if not thousands, of years. 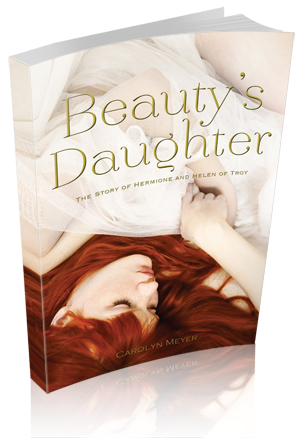 Carolyn has written her stories from the perspectives of numerous non-fictional women, but in Beauty's Daughter has turned her attention toward Greek mythology. Told from the perspective of Hermonie, Menelaus and Helen's daughter, Beauty's Daughter, takes place from right before Paris's arrival in Sparta to a few years after the end of the Trojan War. I was very familiar with everything regarding the Trojan War, but Carolyn does a nice job of going over the story for those who aren't familiar with it. At the same time, for someone who is familiar with the story, I'm not bored with the details. Since the story in told her Hermione's point of view, you're getting a fresh take on the war. Major turning points were addressed, but we aren't bogged down with the mundane. It's obvious Carolyn did her research - as much as one can when it comes to mythology - and it appears that she follows Homer's Iliad when it comes to the war and then the bits of information she could find on Hermione for everything after the war. She address in the afterward that "almost nothing has been written about Hermione. She can be found mentioned in various myths, but those brief references provided me with little material to write about her life" (333). I thought it was a nice touch that while the Trojan War was referenced in great detail, everything afterward mostly came from Carolyn's imagination. She turned the little information that she had about Hermione and gave this woman a voice and a place within Greek mythology. I was happy to see that Carolyn keeps the Greek gods around as major players in the Trojan War and the lives of our characters. Aside from our numerous gods, there are a good deal of characters in the novel, but I found it easy to keep track of who was who. I don't know if that was because I was familiar with the mythology or not, but Carolyn does remind us who certain characters are if we haven't come across them for some time. Some of the characters did feel flat, but some of these characters are so secondary that we only see for a short time before they go off on their own. Sometimes they pop back up again (for a short period of time) and sometimes they don't, so it's not a huge issue. Hermione on the other hand begins the novel full of self doubt, but given how her mother speaks to her, it's not hard to see why. Helen is very critical of Hermione's appearance as she looks more like her father than Helen herself. Unfortunately, this never changes. Even after Helen returns to Sparta and sees her daughter many years later, she is still critical. I would have liked to see more development of Hermione's character. She does become observant and you can see her mature throughout the novel, but considering everything she had gone through, I would have liked more. I was expecting more involvement with Helen given the title of this book, but all we see of her is minimal involvement with Hermione. Like I mentioned earlier, when they do interact, Helen is so critical of Hermione that I kind of just wanted to punch her in the face. Being the most beautiful woman in the world doesn't give you the right to be an a-hole, especially to your own daughter whom you abandoned. Overall, I thoroughly enjoyed Beauty's Daughter. Personally, I never knew that Menelaus and Helen had a daughter so while I found the synopsis to interesting right off the bat, the novel as a whole is equally interesting and attention grabbing. It's an easy read, I finished it within a weekend, but it doesn't take away from the enjoyment of the novel itself. Today we are lucky enough to have the beautiful Helen of Troy with us! Thank you for being here, Helen. I've known of your story for years, but I want to hear your side of events and get to know you a little more. First off, you're known to history of Helen of Troy. Do you prefer that or Helen of Sparta? Sparta, where I was the daughter of a king; Mycenae, where I was the wife of a king; Troy, where I lived with Paris - I was adored in all those places, so it doesn't really matter what you call me, does it? No, I suppose it doesn't. Aside from being kidnapped by Theseus, what was the most memorable moment of your childhood? That WAS a difficult time! I prefer to remember the end of my childhood when men came from every part of Greece, bringing exquisite gifts, treasures that filled the great hall of the palace, in the hope of marrying me. Imagine, all those men wanting me, the most beautiful woman in the world, as their wife! It was thrilling! What is it like to be called the most beautiful woman in the world? Well, it's TRUE, you see, no question about that! You have only to look around to see that there were other women who were very attractive, lovely in fact, but they could not for a moment be considered beautiful in the way that I am. I did worry, though, about their jealousy. It has made a few of them jealous, but most are quite philosophical, recognizing they are not and never will be my equal. I suppose that's rather big of them, especially seeing as how Aphrodite herself proclaimed you the most beautiful after promising Paris the most beautiful woman. Now, seeing as you were already married, you had to sneak away with Paris in the middle of the night while Menelaus was away at his father's funeral. However, when you left with Paris, you took your son, Pleisthenes, and not your daughter, Hermione. Why was that? It was a snap decision. Hermione and her father, Menelaus, were always very close, so I had no worries about her. And I could just imagine that, as she grew older and discovered that she could never be as beautiful as her mother, it would doubtless create difficulties between us. And little Pleisthenes was so darling--so adorable!--that I couldn't bear to leave him behind. You've been refereed to throughout history as having "the face that launched a thousand ships" and you're probably the most famous adulterer of the Greek world. Because of you a 10-year war was fought, countless lives were lost, and an entire civilization destroyed. Do you feel that your actions have been misinterpreted or misrepresented by history? Is it my fault that those silly men, who like nothing better than to wage great heroic battles, used me as a pretext for going to war? I didn't ask them to do it! Hmm, I suppose not. But you can't honestly think that Menelaus was just going to shrug it off and move on with his life, did you? (Interviewers note: Beauty can often be the best camouflage for lacking brain power.) What is something you wish people understood about you leaving with Paris? It was as though Paris had cast a spell over me. I was powerless to resist his love. Sometimes a woman simply has to follow her heart. And your heart led you to Troy. Tell me about your time in Troy. Were you happy there? Did you miss Hermione? Did you regret your actions at any point? Ah, the Trojans! They adored me! And of course that made me happy--I'm happy wherever I'm adored! I hate to say it, but Hermione is a bit of a pain. So intellectual! Like her father! Yes . . . it's so horrible when women are intellectual and have their own ideas and thoughts! *shudders* At any point during your time in Troy, did you regret your actions? Yes, I did regret going with Paris, when I found out that he is really not that interesting or desirable, after the initial excitement wore off. Okay, I'll give you that one. He didn't exactly come off as being one of the better Trojan princes - or man for that matter. Did you learn anything from all that occurred? That being the most beautiful woman in the world does not guarantee lasting happiness. Why, Helen, I believe you just had an intellectual thought of your own. I'm rather impressed. After everything that has happened to your during your life, what is your greatest joy and your greatest sadness? The death of my adorable children, including Pleisthenes, brought me great sadness. My greatest joy, of course, is that my beauty never faded, even with the passing of the years, and that every man I've ever met has found me desirable. Right. Aside from your own saga, which tale from Greek mythology is your favorite? Why? I've always enjoyed the story of how Paris was supposed to decide which of three goddesses was the most attractive. Aphrodite promised him that he could have the most beautiful woman in the world, and that's how he found me! But I guess that's really bringing it back to me again, isn't it? It's amazing how everything always comes back to you. Rather coincidental, don't you think? Anyway, thanks again for stopping by, Helen! You're quite welcome, Andrea, but I must ask--have you considered changing your hair style? It might be more flattering. And a different color lipstick, perhaps?
. . . I'll take that into consideration, thanks. This interviewer is not ashamed to say that once Helen turned around, I made a not so lady like face of mockery in her general direction.